1. As Cindi put it, “God must have a lot of fun.” How can you argue with that when (1) you know that God created all the animals, and (2) you see a giraffe, a koala bear, a California Condor, a seal, a Bactrian Camel (two humps), four massive turtles, a rhinoceros, pink flamingos, and an anaconda. And I’m just talking about a few of the big guys. I mean, did we really need all of this? Yes, we did, if we were to ever begin to comprehend how flamboyant and delightful and comprehensive and omnicreative our God is. 2. A Komodo Dragon can kill prey 15x its size and can eat up to 80% of its own body weight. I weigh about 155. That’s like me killing something that weighs more than two tons and eating 124 pounds of food in a meal. That’s just crazy. 3. The brightly-colored macaws are incredible. I was reminded that fluorescent colors are not man-made. They’re not a synthetic mixture of various natural colors. They are natural. God made them. 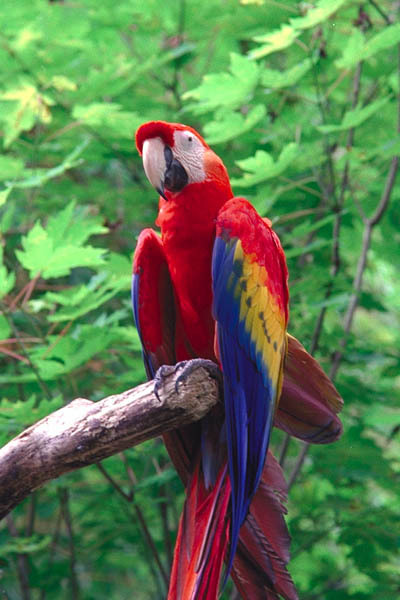 I mean, check out the Scarlet Macaw. For that not to be beautiful, you’d have to be blind in at least one of two ways. 4. Hippos. Need I say more? 5. Out of everyone there, the kids were the ones who were the most enthralled. It was almost as entertaining and enlightening to watch the kids as it was to see the animals. They’re not as tame as we adults (the kids, I mean). They’ll squeal in delight and point and jump up and down and run over to the railing and be mesmerized and then go and tell all their six-year-old friends that the monkeys are just around the corner and we should all run fast to get there because they’re so awesome. The rest of us, too many of whom have lost our ability to be captivated by who God is and what He’s made, we smile politely, say “Wow, look at that,” take a picture, and move on. That’s why I love watching kids. It’s fun to get run off the sidewalk by a mob of souls in a dead sprint to see God’s creation. May they all grow up to have real eyes so that they can see the Creator and all His marvelous works.